Then one day Teddy learns that Sylvan was right. When Teddy finds Nickel and Flora trapped in a snowstorm, he tells them that he will bring them home - and they understand him. The children are afraid of the howling wind, but not of Teddy's words. They follow him to a cabin in the woods, where the dog used to live with Sylvan... only now his owner is gone. 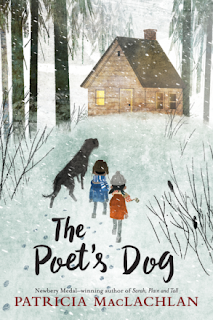 The Poet's Dog is a beautifully written middle-grade book. I'm not often a fan of animal narrators, but as Teddy, an Irish wolfhound, was taught the meaning and value of words by a poet, he turned out to be a fantastic main character. Not only does his love for the poet and for Nickel and Flora shine through on every page, but also his love of home and winter storms and cozy cottages fills the reader with happiness, even in the face of loss. At the surface, loss seems to be what the story is about. After all, Teddy's owner, the poet is gone. The children are the the poet's cottage because they lost their way in a snow storm and cannot get home to their parents. But as the story weaves through both pain and love, it becomes evident that The Poet's Dog is really about the power of love and how it can overcome the pain of tragedy. I highly recommend The Poet's Dog to middle grade readers or as a read aloud. It's sweet, magical, and poignant. My only word of caution: don't be surprised if, after reading this book, your kids try to teach your dog how to talk!